We are starting the third week of BM#55, I will be sharing three healthy breakfast to make for your kids. This month’s edition of Kids Delight is hosted by Lavina. She has been doing BM along with us for quite sometime, though is on a break. She said she hopes to get back to regular blogging, with this hosting. I hope so too, as I enjoy her creative dishes that she cooks for her lil one. Pesarattu is quite famous as Andhra Dosa, infact so famous that I think that many do not even know so many other dishes that are famous from Andhra. I have always remembered eating this as kid. Dad likes it along with the traditional serving of Upmas as well. Of course that’s been a thing of past. Now all of us find the combination to be quite heavy. And since this seem to be the perfect dish for Diabetics, it gets featured once a week. And to make things more healthy, Amma started adding Oats to it. I didn’t realize that Konda likes Pesarattu. I was quite surprised. She said she got used to this as Amma used to feed her this for evening snack when I am not around. So I make this for breakfast, dinner or snack for Konda when we make the batter. Wash and soak the moong dal for 5 hours or overnight. Once soaked, wash and change water. Add oats to the soaked moong dal along with rest of the ingredients to an almost smooth batter. Let it rest for half an hour before making the dosas. When ready to make the dosas, heat a tawa, pour a ladle ful of batter, simmer and top with finely chopped onions along with cumin seeds. Flip on the other side and cook on low flame for the onions to get cooked well. Sprinkle little oil and ghee. Serve with chutney. We served with cabbage coconut chutney. I love pesarattu. Its a really healthy meal anytime of the day! 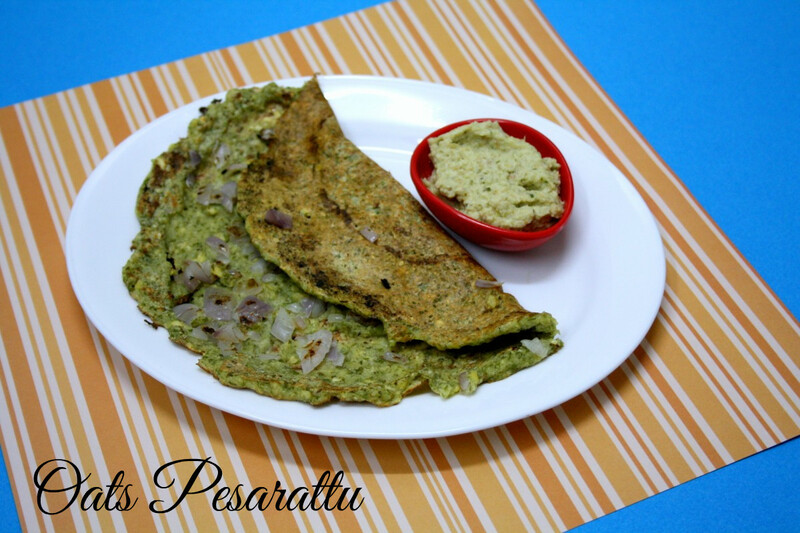 Adding oats to pesarattu is such a nutritious and delicious addition. Looks yummy!! 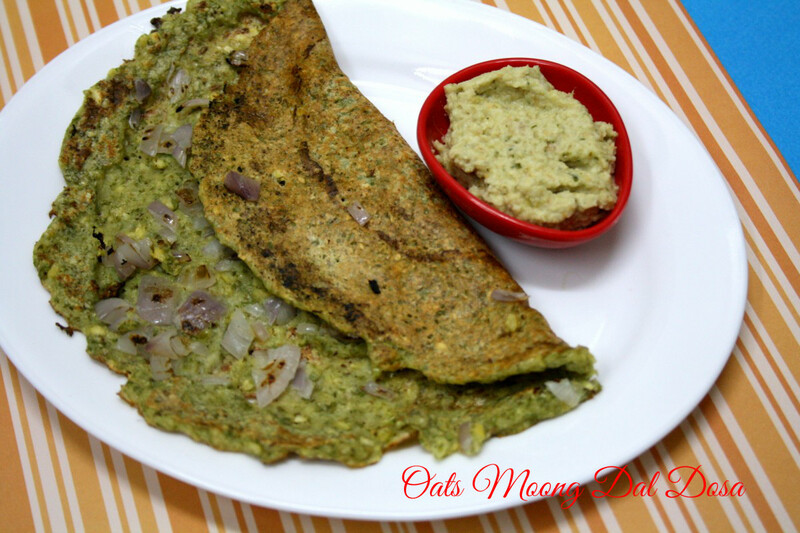 Looks delicious valli, a filling breakfast with oats and moong!! A delicious and yummy breakfast pesarattu. That is a good one, Valli. I shall try it out next time. great recipe with healthy ingredients..love it.. I usually add rice flour to moong DSL. Love the idea of oats….will try it next time!